European leaders have long insisted they will do everything to save the euro. Now, a plan is forming that would dramatically change the architecture of the European Union. Brussels would be granted a significant say in national budgets and debt would be communalized. But the hurdles such a plan might face are high. Politics is a strange business, and one of its premier oddities is that monumental changes are rarely heralded by great speeches. Addresses indicating a shifting course tend not to be of the visionary variety. And the public attention paid to such utterances often has no relation to their far-reaching consequences. Often, in fact, it is only a tiny verbal adjustment that hints at a great change. Or a slightly different tone presaging a new direction. Listening closely to Chancellor Angela Merkel in recent weeks has revealed just such a change in tone. It has been a careful shift, extremely nuanced. But it has become clear that her well-known melody is now a new one. "We need a so-called fiscal union," she said during an appearance on German public broadcaster ARD last week. "Which means more joint budgetary policy." 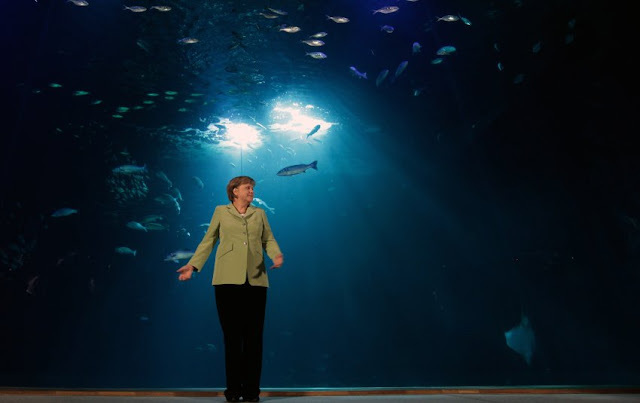 Up to that point, Merkel had merely repeated that which she always demanded. But then came the new tone: "More than anything, we need a political union," she said. "That means that we must, step by step through the process, give up more powers to Europe as well and allow Europe oversight possibilities." Merkel is carefully preparing the public for the possibility that great changes are coming and that established certainties are no longer valid. Her message is that Europe only has a future when the Germans too give up large portions of their national sovereignty. That is the extent of her message, but it is plenty nonetheless. It shows clearly the extent of the threat Merkel now believes the European crisis presents. The chancellor is not a master of the apocalypse in the vein of Green Party patriarch Joschka Fischer, who pronounced earlier this month that "the European house is in flames." That is hardly Merkel-esque locution, but she is fully aware that the abyss is no longer very far away. This coming Sunday, general elections in Greece will indicate whether a country, for the first time, will be forced to leave the euro zone. In Spain, the situation has become serious, with Madrid over the weekend formally asking for assistance from the euro bailout fund. Euro-zone finance ministers have said they would make up to €100 billion available, more than expected. And Spain is not an economic dwarf -- it is the fourth-largest economy in the euro zone. The debt crisis has transformed into a crisis of faith. Few options remain for European Union heads of state and government. Either they will succeed in fixing the birth defects that have plagued the common currency in recent years, or the European Union -- the largest economic zone in the world -- will sink into the mire of failing banks, bankruptcies and collapse. Such a development would significantly overshadow the chaos that erupted after Lehman Brothers went broke in 2008, predicts The Economist. "Something must happen," demand British historian Niall Ferguson and the American economist Nouriel Roubini in a dramatic appeal to the German chancellor. What is to be done? The currency union has to become a political union. At that point, at least, everyone seems to agree. But what exactly that means is a matter of some dispute between Berlin and Paris, Helsinki and Rome. Countries like France and Italy would like to see euro bonds, which would communalize European debt. Germans are opposed to the idea because they fear that, in the end, they would be forced to pick up the tab. Berlin, on the other hand, is prepared to give up national competencies to Brussels, a course to which Paris is opposed. Because they have been unable to find agreement, European leaders have asked top Euro-crats -- European Commission President José Manuel Barroso, European Council President Herman Van Rompuy, Euro-Group head Jean-Claude Juncker and European Central Bank head Mario Draghi -- to come up with a plan. They hope to share some initial proposals at the European summit scheduled for the end of this month. A concrete plan is to be ready by autumn. The four leaders have begun speaking on the phone almost daily. This week, they are to meet to agree on a common proposal that will then be sent to European capitals. For the moment, though, the plan is nothing but sketches of how the European construction might look in the end. The ideas being tossed back and forth between Brussels, Luxembourg and Frankfurt are incomplete, but they already hint at a concept that would mean nothing less than a European revolution. The four are intent on making the currency union irreversible, and deepening it to become a political union. A completely different Europe would emerge from such a process. The plan envisions nation states giving up significant elements of their sovereignty to European institutions. It would mean that the European Parliament would have to fight for relevancy with a new body that would be granted important oversight functions. The result would be a two-speed Europe, the core of which would be represented by the currency union. At the heart of the deliberations is the creation of a real fiscal union, which would prohibit member states from taking on new debt on their own. Governments would only have complete control of funds that are covered by tax revenues. Those needing more money than they generate themselves would have to register their needs with the euro group, made up of euro-zone finance ministers. They would then analyze the financial needs and the amount of funding requested from the different countries before deciding which were justified and which were not. Euro bonds would then be issued to finance the debt. The group of finance ministers would be led by a full-time chair -- and not, as is presently the case, by one of the finance ministers. The chair would ultimately become a kind of European finance minister. A new European body, which would also include representatives from the European Parliament, would be created to oversee the finance minister board. It would mean that the European Parliament would have to give up on its hopes of gaining more power over financial questions, but its competencies relative to other European issues would remain untouched. The model favored by the European four would essentially become a construct that Germany has long rejected: a European club in which all members would be liable for the debts of others. But there is an important limitation: That liability would only apply to new debt. Older debt, of the kind which currently sits at the heart of the crisis, would remain the responsibility of the individual member states. It remains open, however, how that pile of debt might ever be reduced. Already, many countries must already devote a large portion of their tax revenues to service that debt. The idea developed by the Euro-crats would force governments to live within their means and to spend only that money which they take in themselves. Only then would they be able to maintain full national control of their expenditures. Should the concept work, it has the potential of transforming the current debt union into a union of stability. The model sounds almost too good to ever come true. So far, not even Germany -- which enjoys extremely low interest rates and a strong economy -- has been able to get by without taking on new debt. It would also mean that even paragons of fiscal responsibility might at some point have to ask Brussels for help in the case of rising interest rates or an economic slowdown. As a result, a significantly watered down version of the plan is already making its way through Europe's capitals. Accordingly, only new debt which exceeds 3 percent of a country's economic output would have to be rubber-stamped by the finance minister group. A further chapter of the concept developed by the four Euro-crats addresses the need to inject more democracy into European resolutions. Commission President Barroso has highlighted the need to outfit a political union with democratic legitimacy. One such idea envisions the European Commission president being elected directly by European citizens. Another concept under consideration, say sources in Brussels, is that of turning the office of commission president and European Council president into one -- a kind of "European president." Some ideas have already entered the public discussion, such as a European-wide deposit guarantee. The proposal calls for the creation of a deposit insurance fund to be developed over the period of 10 years whose size would be the equivalent of 1 percent of all European savings accounts -- or roughly €100 billion. A powerful, EU-wide bank supervisory body is also envisioned. They would not only keep an eye on systemically relevant financial institutions, but on all banks. Recent years have shown that in Europe, it was the seemingly unimportant banks that created some of the largest problems. That was true of the IKB Deutsche Industriebank in Germany and the same phenomenon can now be seen in Spanish savings banks. Even before it has been officially presented, however, the new Euro Pact faces extremely high hurdles. National parliaments would have to be amended across the continent and several countries would be required to hold referenda. Such a poll might even be required in Germany, as hinted at by the Constitutional Court ruling on the Lisbon Treaty. Should Berlin seek to transfer more power to Brussels on financial questions, according to the most common interpretation of the ruling, then a referendum would become necessary. It would be a momentous decision for German voters. Were they to vote no, it would likely mean the end of the euro and the entire continent would be plunged into a deep recession. Were they to vote yes, future German financial policy would be made in Brussels. It would be the beginning of the United States of Europe. And Germans would likely only be able to approve the plan if it could credibly guarantee that the new political construct would commit to emulating Germany's culture of stability. As such, the four European architects are aiming at establishing a new European consensus. Germany would have to take on additional risks within the euro zone. In return, southern Europeans would have to grant Brussels control over their national budgets -- according to German principles. It would be an experiment with uncertain results. It could, in the end, be the savior of the common European currency -- or it could mean the implosion of Europe. Such a plan could very well calm international financial markets. But it could also be that Europeans wouldn't accept it. Still, it might be the last chance to prevent a collapse of the euro. Next Monday, heads of state and government of the world's largest economies are meeting in Mexico for the G-20 summit. It begins one day after parliamentary elections in Greece -- and the rest of the world will want to know how Europe intends to save its common currency. At the G-20 summit last year in Cannes, developing economies such as Mexico and Brazil lectured Europe on what had to be done. Merkel, Van Rompuy and their counterparts would like to avoid a similar embarrassment this time around. At a meeting of the European Economic and Social Committee in Brussels last Thursday, Euro-Group head Jean-Claude Juncker said that partners in the US and China often tell him that Europe is "behind the curve." He warned that "we are behind the developments." It is time, he said, to consider steps that have thus far been considered unthinkable. "The world has to know that we are absolutely determined." If you want to know whether any set of proposals for a European banking union is sensible, you should ask the following simple question: will it render Spain’s position in the eurozone sustainable? The Spanish government has confirmed that it is now ready to seek EU aid. But the idea for the European Financial Stability Facility to lend money to the Spanish bank recapitalisation fund, known by its Spanish initials Frob, does not meet this test. It reshuffles debt from one end of the Spanish economy to another. Spain’s total debt was 363 per cent of gross domestic product in mid-2011, according to a report by the McKinsey Global Institute, and with the prospect of a severe economic depression ahead, its crisis cannot be solved through a combination of austerity and liquidity support. The eurozone must recognise that some form of debt relief, or default, will be inevitable. This could come through various channels. One way would be for a eurozone agency to inject direct equity into the Spanish banking system, and then break it up. Such a system does not yet exist. It requires a new inter-governmental treaty that would sit alongside the existing eurozone crises treaties – the fiscal pact, and the treaties of the EFSF and the European Stability Mechanism. So what elements should a treaty on a banking union contain for it to meet our test? First, a deposit insurance corporation that insures the euro value of each bank deposit up to an agreed ceiling, say €50,000. The European Council should give an immediate political commitment that it would make good such losses even in the most extreme circumstances. The political commitment should be followed up with the creation of a formal deposit insurance company, perhaps implicitly backed by the European Central Bank. Second, a recapitalisation and resolution authority that is workable and large enough. Ideally, such an authority would be completely centralised. The European Commission’s resolution proposal last week was entirely useless because it stuck to the principle that each country resolves its own banks. This is utter madness in a monetary union. Unless you separate the Spanish prime minister from his banks, you will not re-establish trust in the system. After what happened at Bankia, no one in their right minds believes any published account of a government-backed Spanish bank. We have to get real here. Most people involved in financial regulation in the EU are totally oblivious to the constraints of a monetary union. Third, bank regulation and supervision. This is the area that will interact most with European legislation – an annoying complication. The question to be answered by the EU summit on June 28-29 is whether the eurozone should go it alone, or whether the European Banking Authority – an EU level institution – should fulfil that role. Fourth, following a commitment to a banking union, the European Council should agree interim measures for Spain with a commitment to applying the new institutional rules when they become active. As a first step, there is probably no alternative to an EFSF loan to the Frob. But this must be accompanied by a commitment to turn the loan into equity. That would require restructuring with the aim of shrinking the Spanish banking sector. What about the loftier goals of a fiscal and political union? EU leaders should now focus on the banking union first because it is the most important and the most urgent element of a fiscal union. Once this is agreed, they should proceed to discuss how such a banking union can be embedded in a wider fiscal and political union. Such a process would probably take several months, and may not be ready until December. A monetary union without a full banking union is unthinkable in an internal market. But there are different plausible constructs of a wider fiscal union. EU leaders should not revert to the complacent mood of the last two and a half years. The world is watching them. A seasoned EU observer told me this week that whereas until recently financial markets knew nothing about EU politics, they now know too much. The European Council should not even think about a “political agreement”. They need to agree details. Investors want to know whether there will be burden-sharing; joint equity in Europe’s banks; a joint resolution authority; and deposit insurance. They want to know how these ideas will be organised, their legal status and how they interact with existing institutions. They want to know this so they can judge for themselves whether Spain can be saved or not. Spain’s situation is simply not sustainable with present market interest rates and institutional arrangements, and nor is Italy’s. I said last week that I was more optimistic than the new market consensus. That optimism is premised on a substantial agreement. If they fudge it, I, too, would conclude that it is time to prepare for the end of the eurozone. The FDIC and the taxpayer are the underwriters of too much private risk taking. I have a proposal to strengthen the U.S. financial system by simplifying its structure and making its institutions more accountable for their mistakes. Put simply, my proposal would help prevent another 2008-style crisis by prohibiting banking organizations from conducting broker-dealer or other trading activities and by reforming money-market funds and the market for short-term collateralized loans (repurchase agreements, or repos). In other words, Glass-Steagall for today. .Those opposed to taking these actions generally focus on two themes. First, they say that if Glass-Steagall—enacted in 1933 to separate commercial and investment banking—had been in place, the crisis still would have occurred. Second, they argue that requiring the separation of commercial banking and broker-dealer activities is inconsistent with a free-market economy and puts U.S. financial firms at a global competitive disadvantage. Both assertions are wrong. .Advocates of the first argument say the crisis was not precipitated by trading activities within banking organizations but by excessive mortgage lending by commercial banks and by the failures of independent broker-dealers, such as Lehman Brothers and Bear Stearns. .This assertion ignores that the largest bank holding companies and broker-dealers were engaged in high-risk activities supported by explicit and implied government guarantees. Access to insured deposits or money-market funds and repos fueled the activities of both groups, making them susceptible to the freezing of markets and asset-price declines. .Before 1999, U.S. banking law kept banks, which are protected by a public safety net (e.g., deposit insurance), separate from broker-dealer activities, including trading and market making. However, in 1999 the law changed to permit bank holding companies to expand their activities to trading and other business lines. Similarly, broker-dealers like Bear Stearns, Lehman Brothers, Goldman Sachs and other "shadow banks" were able to use money-market funds and repos to assume a role similar to that of banks, funding long-term asset purchases with the equivalent of very short-term deposits. All were able to expand the size and complexity of their balance sheets. While these changes took place, it also became evident that large, complex institutions were considered too important to the economy to be allowed to fail. A safety net was extended beyond commercial banks to bank holding companies and broker-dealers. In the end, nobody—not managements, the market or regulators—could adequately assess and control the risks of these firms. When they foundered, banking organizations and broker-dealers inflicted enormous damage on the economy, and both received government bailouts. To illustrate my point, consider that if you or I want to speculate on the market, we must risk our own wealth. If we think the price of an asset is going to decline, we might sell it "short," expecting to profit by buying it back more cheaply later and pocketing the difference. But if the price increases, we either invest more of our own money to cover the difference or we lose the original investment. .In contrast, a bank can readily cover its position using insured deposits or by borrowing from the Federal Reserve. Large nonbank institutions can access money-market funds or other credit because the market believes they will be bailed out. Both types of companies can even double down in an effort to stay in the game long enough to win the bet, which supersizes losses when the bet doesn't pay off. The Federal Deposit Insurance Corporation (FDIC) fund and the taxpayer are the underwriters of this private risk-taking. This leads to the second criticism of my proposal—that breaking up the banks is inconsistent with free markets and our need to be competitive globally. The opposite is true. My proposal seeks to return to capitalism by confining the government's guarantee to that for which it was intended—to protect the payments system and related activities inside commercial banking. It ends the extension of the safety net's subsidy to trading, market-making and hedge-fund activities. This change will invigorate commercial banking and the broker-dealer market by encouraging more equitable and responsible competition within markets. It reduces the welfare nature of our current financial system, making it more self-reliant and more internationally competitive. Capitalism will always have crises and the recent crisis had many contributing factors. However, the direct and indirect expansion of the safety net to cover an ever-increasing number of complex and risky activities made this crisis significantly worse. We have yet to correct the error. It is time we did. Mr. Hoenig is a director at the FDIC. His proposal, "Restructuring the Banking System to Improve Safety and Soundness," is at www.fdic.gov. “It was the credibility of the euro that won”, said Spanish prime minister Mariano Rajoy, introducing the €100bn bailout of Spain’s banks over the weekend. “This shows the euro area is ready to take decisive action,” proclaimed European Commissioner Olli Rehn at the same time. These statements are worrying. Does anyone on the planet think that problems surrounding the credibility of the euro have been solved by this emergency action? Does any overseas investor believe that a corner has been turned, when the German government continues to set its face against the mutualisation of debt? .We can only hope that Mr Rajoy and Mr Rehn are, as politicians are wont to do, treating the public with contempt in trotting out these bromides. The alternative explanation, that they really believe the problem has been solved, is far more worrying. Of course the deal is a step forward. For once, the scale of the funding put in place is above the worst market estimates. After months of denial, the Spanish government has obeyed the first law of holes – when in a deep one, stop digging. They have accepted that they cannot resolve their banking problems unaided. But the Spanish banking system still needs a fundamental overhaul. The old system of political cronies running regional savings banks, channelling savings into politically driven development projects, has hit the buffers. It is only weeks since Rodrigo Rato was removed from the chairmanship of Bankia. Will the government have the courage to clean out the other stables? This raises difficult national/regional issues, always fraught in Spain. There is a brand new Bank of Spain Governor who will need to assert himself quickly. .And at European level the picture remains clouded. The Germans say they will only envisage debt mutualisation, and other key aspects of a banking union, if there is a decisive move to political union. The French government rejected Chancellor Angela Merkel’s proposals at once. There is still no consensus about what concrete steps need to be taken to solve Europe’s banking problem, and in which order. The European Commission is working hard to produce a package by the end of the month. It is a tall order. There is only one clear consensus view to be found among the Treasuries of Europe: that the less the British government says on the subject, the better. .So the next few weeks will be fraught with danger. It seems probable that, in Greece, fear of the unknown may prevent a Syriza-led government emerging. Voters will hold their noses and vote for New Democracy and Pasok in sufficient numbers to avert calamity. But the Greeks are nonetheless unlikely to be able to meet the terms of their latest bailout and Oliver Twist-like, will come back for more. Will the troika be sympathetic, and if so on what terms? And if they decline, is there a Plan B in place for a eurozone departure? .So the victory declarations this weekend look as misplaced as Manchester United’s premature Premier League victory celebrations a month ago. There is much more to do, and very little time in which to do it.